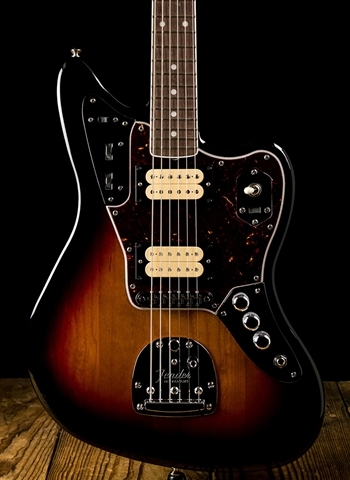 Return to the dark intensity and huge guitar sounds of the grunge rock movement with the Kurt Cobain Jaguar, a new-looking version of the battered and highly unusual 1965 Jaguar that Cobain wielded during the heady early-’90s era when Nirvana ruled rock and led a musically stunning and culturally subversive movement. It authentically evokes the modified left-handed Jaguar that Cobain found secondhand and came to prize shortly after the recording of massive 1991 album Nevermind, complete with DiMarzio humbucking pickups, special switching, exclusive in-case extras and more. Available in right- and left-handed versions.